Over at Cartoon Brew they have premiered the brand-new trailer for the upcoming animated film Song of the Sea, directed by Tomm Moore. Like Moore’s previous film The Secret of Kells, this new feature will be hand-drawn in a traditional 2D fashion with a highly stylized design. And, like that first film, this new one is based on the legends and lore of Ireland — in this case, the story of the Selkies, magical beings who are seals in the ocean but can shed their furry skins to become humans on the land. 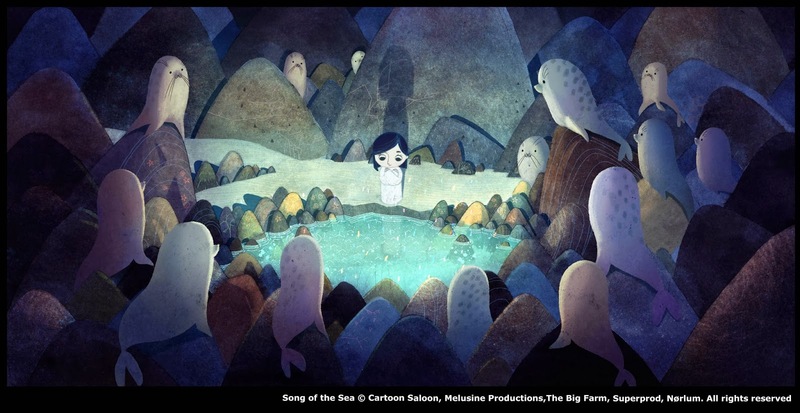 “Song of the Sea tells the story of Ben and his little sister Saoirse – the last Seal-child – who embark on a fantastic journey across a fading world of ancient legend and magic in an attempt to return to their home by the sea. ” As with The Secret of Kells, Songs of the Sea has been picked up by GKIDS for distribution in North America. Now if we could just get a firm date for its release!